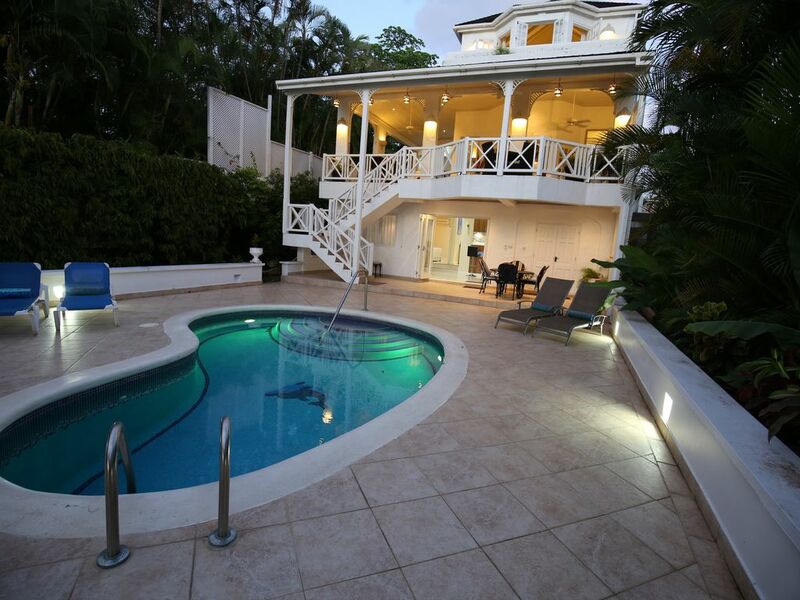 Weston House is a beautiful luxury house, just 50 feet from the beach on the west coast of the island with fabulous views of the Caribbean Sea. Relax on the pool deck with a long cool drink, or walk through the garden to stroll along the white sands of the beach and dip your toes in the tranquil blue waters of the Caribbean. The fantastic housekeeper will welcome you upon your arrival, and will provide you with a relaxing and unforgettable vacation. She will treat your palate to both local and worldwide cuisine, comments of which can be found in the visitors book in the house. Her local knowledge is invaluable, and no task or request is too much, whether it is a private yacht charter or big game fishing to the local bus service, she will help you find it. This tranquil setting is an ideal location for private parties and weddings (by special arrangement). A full range of water sports is available 200 yards up the beach. Within easy reach there are many first class restaurants, both on the west and south coasts. You will be only a five minute drive from an 18 hole championship golf course, rated number 34 in North America. The towns of Holetown and Speightstown are within easy reach to get the real flavor of island life. Weston House will truly give you the feeling of a millionaire lifestyle, with its private surroundings and superb quality. Weston House is a great property. Location can’t be beat. However, the staff of Deborah and company is what really makes this a special place. Everyone in our party of ten had a great time. We would definitely book Weston House again. Thank you Brett for the wonderful review of your stay at Weston. We can never sell how special and fantastic Deborah is to all our guests. We would love you to post this review on tripadvisor if you can. Heavenly Paradise! A Real Family Vacation! I have traveled to many places and this is the entire package. I took my family (Wife, Son (7yr), Twin daughters (3yr), & father in law) for a week. Lets start with the house. It is incredibly well maintained and spotless. The house is large and plenty of room for many more people. The bedrooms have AMAZING views. We didn't end up staying in the apartment on the pool level but did use it for the girls to take naps during the day while we sat by the pool. The apartment is essentially a stand alone rental in itself! The pool was just the right size and we loved the grounds. It is in a perfect spot without tons of tourist. You practically have the beach all to yourself! It was amazing and felt very safe. We would snorkel out in front of the house and saw many colorful fish and sea life. Try the local bar and fish market just a short walk from the house. We did see a family of monkeys that live in the area and our kids loved that as well. The best part of the trip was Deborah and Alecia! Sometimes they have a third person but we were a smaller group so it was not needed. Although they come with the house, they deserve thier own section. Deborah welcomed us with a warm smile and an delicious meal when we arrived. Typically when we rent houses, we have to cook and clean up. If you have kids you know that vacation isn't always relaxing because you are constantly cooking or cleaning etc. This was a TRUE vacation because we didn't have to do any of that. We felt like royalty. Deborah and Alecia went above and beyond to take care of us. I have a couple of picky eaters and if they wouldn't eat her food, Deborah would cook up something they would! It was nice to try the delicious local food without leaving the house. As for the Island. We rented a car to explore. Fairly easy to get around and such a diverse Island. I recommend going north to look at the ocean crashing against the cliffs and east to Bathsheba. If you have kids you must go to the wildlife preserve. We also snorkeled with the turtles and they picked us up right at the house! I would go on but they cut me off with how much I am allowed to write... CANT WAIT TO COME BACK!! I cant leave out how amazing Anna and Graham were as well. They went above and beyond to welcome us to the home and answer our call at 11:00 at night! Very special place that we will never forget! We stayed in the Weston House from April 1-8, 2017, and found the house in excellent condition, spotlessly clean, and perfect for a multigenerational gathering. The pool is perfect for floating and staying cool, and the ocean literally right outside the gate is beautiful. Deborah and Wendy were wonderful, and they attended to our every need. They are happy to serve up fresh fish from the market just a block away making the best food on the island served on the veranda with lovely evening views of the ocean. It is a pleasure to give a big THANK YOU to Deborah who stayed up to greet us at the house at 2 AM upon arrival as our flight had been delayed by 4 hours. Was that a huge relief!! Things to do that we all loved: 1) Snorkeled out behind the house as well as rented a private boat from Rupert (friend of Deborah) who picked us up behind the house in his boat and we saw turtles, a shipwreck, many fish, stingrays, and coral, 2) Went to Andromeda Garden on the west side followed by a picnic at a park near the Soup Bowl and watched the surfers (very, very beautiful), 3) Went to the North End to Animal Flower Cave and hiked along the cliffs watching the waves crash violently against rocks followed by a trip to Little Bay to see the Blow Holes (Very Cool! ), 4) Hung around the Weston House and drank several cases of lovely Rose', Chablis, Red Burgundy, and Rhones purchased from Wine World just 10 minutes from the house, 5) and to make all Caribbean Trips complete we visited the Mount Gay Rum factory and really enjoyed that as well! Barbados is a lovely island with beautiful water and plentiful fish. It is very safe and we found all the people friendly and gracious. There are all the amenities to make for a stress free vacationing. And what was really surprisingly wonderful was that there were NO MOSQUITOS on the island anywhere. None of our group got bitten by any insects at any time which is quite different from most of our trips to the Caribbean. Finally, the best place to see the monkeys was at the Weston house as they seemed to drop in for happy hour most days. Usually we saw a couple of them, but a couple times there were 4-5. This was a great trip! I would love to come back! Thanks again, Deborah!!! The five star reviews are accurate. My group was 5 active seniors that live the good life in Pennsylvania. All were pleased with every aspect of Weston House. The house easily accomidated 5 couples. Bedrooms are large and all sitting areas comfortably seats more than 10 people. Deborah is a 5 star cook and her helpers keep the house, sheets, towels and your laundry clean every day. The house has all of the beach/pool toys and chairs. The kitchen and wet bar is well stocked. The title of my review is exactly how my family and I felt as we entered Weston House last month. From the moment we pulled into the gated drive and walked through the arched doorway we felt as though we had stepped into a heavenly castle in a magnificent dream! We were greeted with open arms by Deborah and Wendy who both made us feel as though we were arriving home after an extended absence. Their warmth and hospitality were genuine and contagious. The house itself is absolutely stunning and the photos can only just begin to portray the reality of its design, function and breathtaking location. The views through the house, across the pool and garden area and right into the horizon of the Caribbean are enough to keep you mesmerized throughout your vacation. The wide open layout of the living and dining spaces allow you to lounge and dine under cover but fully exposed to the island breezes and sounds of the birds and the sea. Our entire family enjoyed lounging around the pool throughout the day with occasional jaunts to kayak in the sea or snorkel above the small reefs just off the private beach in our backyard. Come lunch and dinner time the ladies would summon us up to the outdoor dining area and serve up the most delicious menus of fresh meats, fish, chicken or pork accompanied by all the best vegetables and trimmings. If we didn't feel like shopping for the groceries that day Deborah or Wendy were more than happy to handle it for us. Water sports were handy just up the beach and we had jet skis brought to us right on our beach where we could all take turns riding the waves for hours on end. Several local bars are within walking distance including Marcy's Bar and John Moore's among others. I cant say enough about the local people and how warm and welcoming they all were. In fact one rainy night we had a blowout as we drove up to Marcy's for some refills and no sooner had I stopped the van to survey the tire damage, that there were several local folks happily volunteering to change the tire and get us going again. Truly guardian angels of the night! I'd be remiss if I didn't mention the owners, our hosts for the week, Anna and Graham. From the first inquiry and interaction, both of them were like old friends but professional in all respects. Every question was answered quickly, any issue encountered was resolved immediately and every one of their suggestions was spot on! Sadly I'm out of space now but suggest you book your stay immediately! Thank you and we are thrilled that you had such a fantastic time in our beautiful home. You are welcome to return anytime and we are pleased that you were well looked after by Wendy and Deborah. We just returned from a wonderful stay at the Weston House. The house, property, and location were all truly spectacular. The house was spacious, comfortable for relaxing, lounging about, and had everything you can ask for. The beach was beautiful and we spent hours daily swimming, snorkeling, paddle boarding (we had rented paddle boards and delivered to the house) and walking the beach. When not at the beach, we relaxed at the pool well into the evening hours. We had rented a car for the week and drove all over the island exploring; we were happy that the Weston a House gates were always visible day or night and that we always found our way back without difficulty. Many reviewes mention Deborah and staff, and for good reason. They are wonderful, and the meals are very special. We always looked forward to whatever they would prepare, and were never disappointed by the very flavorful meals. We have traveled all over the world, and have rented many a villa, and I can say this place deserves the 5 stars all around. I would come back here without hesitation. The prices shown are for parties of 2-6 people. Prices for parties of 8-10 people on request for both Summer and Winter stays. Christmas/New Year and Easter breaks, prices are available on request.